Richard Krueger and Ronald Leax, both art faculty at Washington University in St. Louis, incorporate the images, processes and even the materials of science into art constructions that mimic biological sciences, the realms of fantasy, and laboratories. Krueger suggests that the sciences of artifice, including reality simulation and gene manipulation, have revivified reality as theater. His photographic constructions illustrate a world of fantastic invention and extrapolation upon the natural world. 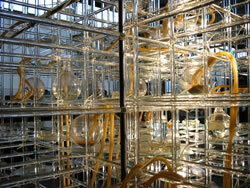 Leax creates fantasy laboratories/large-scale sculptural constructions to illustrate the investigations of the laboratory; the interpretations of the art studio; and the coherence sought in the temple.